Most Central war room team members are loyalists who have been with AAP since its inception. They submit a daily report to AAP leader Gopal Rai every night. 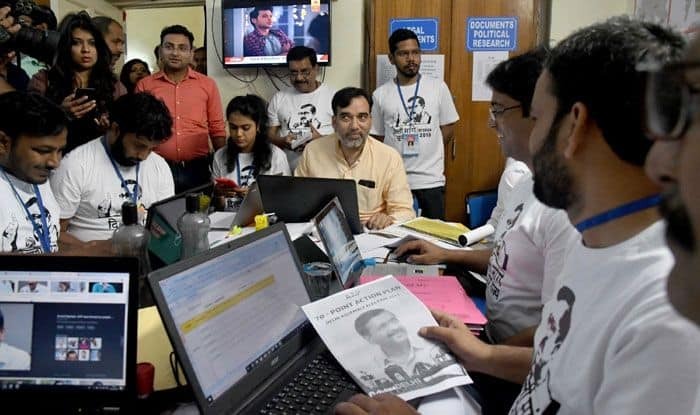 Gearing up for the Lok Sabha polls, the Aam Aadmi Party (AAP) on Friday launched its central ‘War Room’ comprising a 20-member team in New Delhi. Similar ‘war rooms’ have been established in each of the seven Parliamentary constituencies in Delhi. “The 20-member team sitting here will coordinate with the teams working on the ground. as well as the ‘war rooms’ in the constituencies,” said Rai. Most Central war room team members are loyalists who have been with AAP since its inception. They submit a daily report to Rai every night. “Based on the report I receive, we strategise and plan our next move. The directions are conveyed to the Central room, which informs the others,” said Rai. The war rooms also take care of the volunteers coming from outside Delhi. The party has appointed Observers in each of the Lok Sabha and Assembly constituencies. “There are seven observers for the Lok Sabha constituencies and 70 for the Assembly constituencies. None of the observers are from the area they represent,” the AAP leader added. They all share their observations with the Central war room, which uses this information while preparing its report. The party has also appointed a team of 14 people for Emergency Feedback, who will inspect the ‘war rooms’ and check the implementation of campaign plans on the ground. “In all about 1.5 lakh people will be involved in our campaign on the ground,” he added.